If I were to tell you that if you could hit a ball as hard as you can, while maintaining a ball height of no more than 2 feet above the net, from the baseline and not hit it out on the other side, would you believe me? Of course you would not, how could I possibly make that happen? Oh and did I mention the equipment being all monofilament at a tension no more than 52 pounds of tension (23.5 kilograms) in any tennis racquet of your choosing? It all sounds too good to be true, although, it is a reality and I know from first hand experience. How is all of this even possible? I mean, how can stringing a tennis racquet at a lower tension going to keep tension longer of two or three times or more and keep the ball in play no matter how hard you hit it, and finally a string that will not break in that time all the while keeping the same playability of when the string was freshly strung? It all has to do with the tennis strings and way they were installed into your tennis racquet. It has everything to do with a new tennis string that has recently been introduced to the market, though it has been around for quite some time, just not commercially. Enter L-Tec, a revolutionary tennis string that stands for Low Tension Energy Control. The L-Tec tennis strings were designed by John Elliot, an Australian transplant to France; who has participated in the design of many of the tennis strings your are currently playing with. I had the absolute pleasure of spending an entire day with this legendary string designer, who has more than 20 years experience in the tennis string and stringing industry. Elliot and I spent the day chatting about strings and installing strings. Eliot spent most of his time explaining to me his method of installing strings, the JET method. John told me all about how tennis strings lose their elasticity after being pulled above 52lbs (23.5 kg), essentially killing the string; this information particularly resonated with me because I used to string my tennis racquets at about 60lbs (27 kg) which led me to question every single tennis string I’ve used at that tension. Either way, Elliot explained his technique to me and it all made absolute sense. – The L-Tec tennis string coupled with the JET method allows the strings to last longer (without breakage), about 2 or 3 times longer. 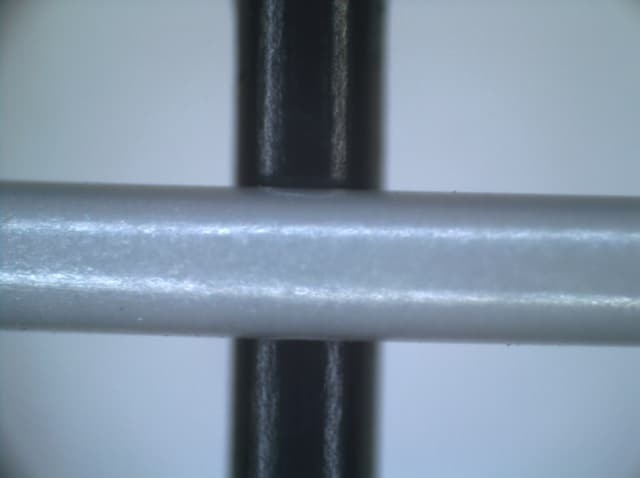 By having two differently shaped surfaces (I’m talking of a full poly hybrid) that run flat against each other, unlike a one piece where the shape of the string is the same at every point of contact (cross section), there is significantly much less ‘cutting’ happening at the contact point – this is also known at notching. Basically, the strings are free to move around on each other; no matter which string grabs the ball, cross or main, the string will move at ball impact and snap back into it’s resting place at a higher rate than normal strings. Cool right? – It’s a less expensive string to have installed. Yes, the L-Tec is not the cheapest monofilament tennis string on the planet at $22 a set; however, like I’ve said it will last two to three times longer. Lots and lots of strings claim that they can last longer and hold tension longer, well absolutely nothing compares to the L-Tec. Again, because of the way the strings lay on each other there is minimal notching or cutting, thus allowing the strings to not break from the cut. So the chronic string breaker will appreciate not having to replace his or her tennis strings after every practice or match from a busted main or cross. Strings also go dead, we all know that, the L-Tec plays better longer because the composition and design of the strings allow for a longer life when installed properly. – With those two key factors being said, how on earth does that make for a better playing experience for the player? It’s simple really, you will hit harder, with more control, and more spin than you ever have. By having a string that is allowed to move about the cross section of the strings; the strings have not been pulled beyond their elastic limit (maximum stress or force per unit area within a solid material that can arise before the onset of permanent deformation.) can gracefully go back to their natural position while catapulting the tennis ball generating the spin from the stringbed. This all probably sounds too good to be true, believe me, this is no sales pitch, these are facts that I have experience myself. 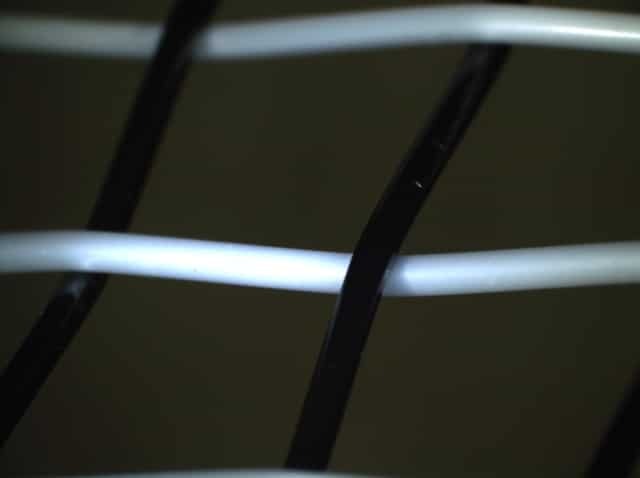 The truth lies with the method of installing the tennis strings, or as John Elliot liked to call it, “tuning the tennis racquet.” The JET method of tuning is a slower process, there is nothing fast about it, the machine is a drop-weight, and there are no fixed clamps, both nearly unheard of in the professional stringing world. When it comes to professional stringing, it’s all about turnaround; how many tennis racquets can be pumped out per hour, however; the JET method is all about string quality and never about quantity. Elliot showed me how the tuning takes place, John creates a stringbed landscape that is soft and powerful in the center and tightly controlling around the perimeter of the stringbed. When I was shown how all this was done, Elliot told me about sharing tension and how off center shots benefited by having a sting that is at a tension of control orientation in the places where control is needed; in the places where power and spin is needed is where the string tension is lower; does it make sense to you yet? The JET method is really interesting because there is absolutely no loss of tension on the pesky outside main strings, you know, the strings that get tied off; all of this is done in order to create the most consistent stringbed tension. Because the L-Tec tennis strings are designed specifically to be installed using the JET method, the tension loss is ridiculously low, I mean; I hit with my frame strung with L-Tec and JET installation already for about 5 hours of heavy hitting, 4 sets, and I have only lost 1 pound of tension. ONE POUND! That has to say something about this string and installation technique. So who is using this tennis string? I can’t tell you any names, though I can tell you would be surprised that many professional level tennis players are already using the L-Tec tennis string coupled with the JET technique. The big question; who should use this tennis string and method? Well, first it should be used by player who can actually tell the difference between tennis strings, playability, durability, power, control, and finally spin. It’s not for the beginner (sorry!) or the low level junior; it’s designed for big hitters and precision players who look for the perfect balance of string characteristics to take their game to places they’ve never seen before. It is going to be the next big thing in tennis, if you don’t believe me, just wait and see….